Get maximum exposure, qualified leads, color digital photos, Internet distribution and inventory management for all your new and used vehicles with Dealer Specialties of South Carolina, Inc. It is possible to print your own window labels, buyers guides and place your vehicles online with your in-house representative. But why deal with the headaches of the unexpected problems and costs that will inevitably arise. Let our experience in Internet sales , data collection and data distribution allow you to focus on your specialty, selling vehicles, while we professionally deliver your Internet content to the world online. Dealer Specialties Intl., a division of Trader Publishing Company, is a worldwide leader in providing automobile dealers with data and digital photo collection services, and descriptive used vehicle window stickers. 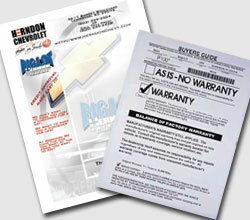 We currently process more than 300,000 vehicles per month. Dealer Specialties has built relationships with some of the most powerful and well-known services on the Web to keep our dealers’ data flowing across the Internet. At Dealer Specialties of South Carolina, Inc. we feel that in achieving our goals our company must be guided by the highest caliber values which play toward the quality of our organization. 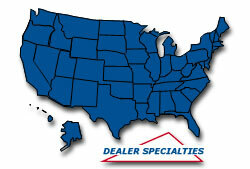 Click below to view current Dealer Specialties Customers from the nationwide database. Dealers have the option of single, or multiple photos of each vehicle, including both interior and exterior shots. The most successful salespeople do a "walk-around" on a vehicle, using the new-car sticker to build value in their product.